Emerson has unveiled a new line of compact transmitters. Designed specifically for hygienic applications in the food and beverage industry, they will enable manufacturers to minimise downtime and lower production costs. • Rosemount 326P: for improved efficiency and safety, this transmitter is used for hydrostatic level measurement on fermenter tanks, storage tanks and silos, as well as static pressure measurements on pipes or near pumps to ensure line pressures are in tolerance. 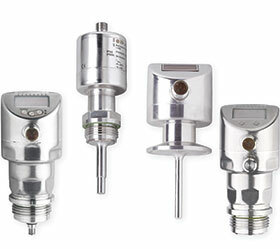 • Rosemount 326T and Rosemount 327T: for improved product quality and consistency, these transmitters monitor process temperature, an extremely important factor in all steps of food and beverage processing such as fermenting or pasteurisations, storage tank temperature, or ensuring your clean-in-place processes are within FDA approved limits for an effective cleaning cycle. • Rosemount 326L: to keep product lines running and reduce downtime, this transmitter will monitor continuous level in small- to medium-sized storage, holding or buffer tanks. All comply with 3-A and FDA specifications, and are available with nine common industry process connections to ensure the right fit for new tanks and pipe fittings, as well as capability to be retrofitted on legacy systems. The new, small transmitters also can be mounted in tighter locations common on packaging machinery. Conventional 4-20 mA outputs and IO-Link connectivity make the transmitters easy to integrate with automation systems. Emerson has leveraged its experience to offer the performance and features of the new Rosemount line as required by most hygienic applications, but in more compact form factor. As a result, plants and facilities can now use Rosemount transmitters for all their applications, eliminating the need to engage with multiple suppliers to cover the full range of options. These new transmitters expand Emerson’s food and beverage offering enabling manufacturers to increase product quality, consistency and safety. Emerson’s food and beverage portfolio also includes pervasive sensing solutions and Plantweb Insight analytics for steam traps and pumps, which allows manufacturers to harness digital transformation to realise operational improvements.